You can access your system at anywhere anytime to manage your business at just your fingertips because SimBiz Accounting System is such an ease to use web base system. 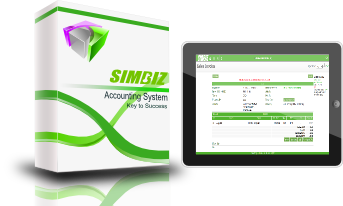 With SimBiz Accounting System, you can just spend your time on what you do without struggling with complicated software on understand how it works. What wait for, come to experience yourself with our online accounting system. Protect from database damage while multi-users access same data at a same time. SimBiz support data export to spreadsheet and PDF format. With simple and clear summary chart and table, you can know well your company performance and latest status in just a page view. Our system support multi-currency transaction. You can manage your foreign exchange rates by setting your control date range and know your foreign exchange gains and loses exactly. Transactions and reports are control separate by branches, you can easily access your branches data by one simple click. Our system allow multi-exchange rate control with period control. You can control modules and functions accessible permission base on your staff position and level. Multi layer chart of account enable you view and manage your accounts easily and clearly. Simple cheque matching with tick box function. Support backward bank reconciliation statement. Double entry journal ledger allow you reduce human error. Knockoff invoices is so easy within your fingertips. User friendly input screen for you to create debit note or credit note if any additional add on or customer return. Unlimited transaction of quotation, sales order and invoice can be created. Automatic duplicate function allow you generate sales order and invoice from quotation by a single click only. All documents in PDF format make you easily send to your business partner by email or print out for fax. 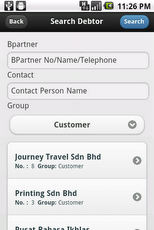 You can input several different address under same company. 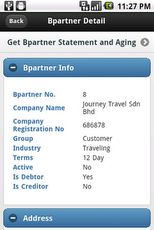 Unlimited contact details and address can be created under one business partner. SimBiz's credit control function help you prevent bad debt cases. 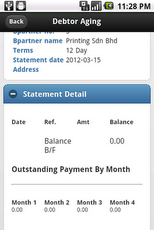 Product master make you input invoice efficient and productive. SimBiz Mobile Apps can be download from Google Play here.